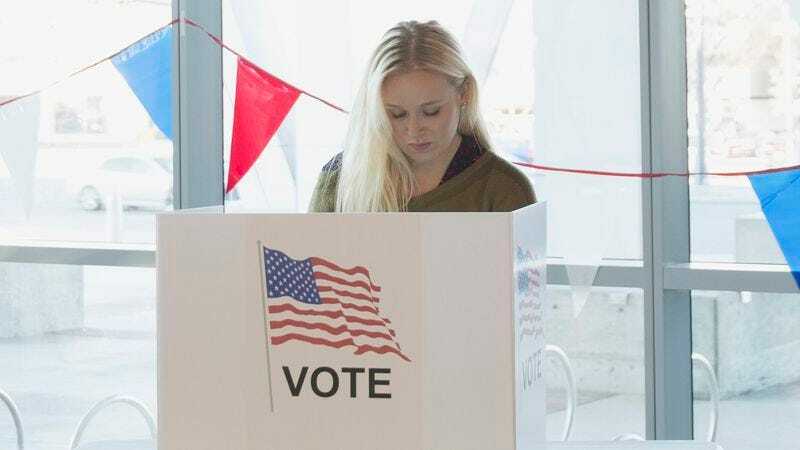 WASHINGTON—Saying it’s nice sometimes to let their imaginations run wild, the nation’s female voters told reporters Tuesday they have been fantasizing a lot lately about some far-off presidential election in the future that is not absolutely crucial to their well-being. “It would be really nice if, someday, my basic rights and day-to-day happiness are not entirely determined by the outcome of one vote,” said 29-year-old Olivia Holden of Newton, MA, who admitted that she, like women across the country, had been regularly daydreaming about what it might be like to cast a ballot in an election in which the opportunities available to her did not hinge on the result. “Can you imagine if, no matter who won, I still felt like an equal member of society and comfortable in my own skin? That would be amazing. It’s kind of fun to imagine.” At press time, the nation’s women’s daydreams were broken by the sound of breaking news push notifications on their phones alerting them to the latest national poll results showing a tightening race.